Judging by the Cover – 2/13/19 new releases – AiPT! Jason and Eric share their favorite covers from this week’s new comics. In that spirit, here are the covers that captured Adventures in Pod Taste host Jason Segarra and Manga Editor Eric Cline’s attention this week. If you’ve listened to Adventures in Pod Taste even once, it should come as no surprise that I’m a shameless hipster. That it’s then taken me two issues to get into a series about a hitman/up-and-coming rock band set against the music industry of the ’80s is a shock to us all. If anything was going to get me into this series it’s covers like this. This looks like it could easily grace the jacket of a New Order record (I’m like 70% sure it’s an homage to an album cover and that I can’t place it is killing me), and I love it. Divorced of the series itself, this is an image that I love and could see hanging on a wall somewhere – the sign of a great cover. I feel like I include a cover like this every time I do one of these posts, but I can’t help it. I’m a sucker for dichromatic contrast. This is another one that I could see hanging on a wall, not just on the rack at my local comic shop. Yeah the text sounds like the intro text to a fun movie (or a baller sneaker ad), but I dig it and the overall aesthetic. It’s a solemn, ponderous image that really fits a book enjoying it’s swan song. Great work from Fuso here. What can I say? I love a book with big ideas, and even a cursory glance at the cover to Gideon Falls’ eleventh issue shows that this is a title with a lot of ideas behind the pages. This is a captivating image that should be the screensaver on everyone’s phones next week. It’s a beautiful use of color and simple, evocative imagery that speaks volumes and really sells the scope of the series without so much as a word. Literally stellar stuff. This is just lovely. 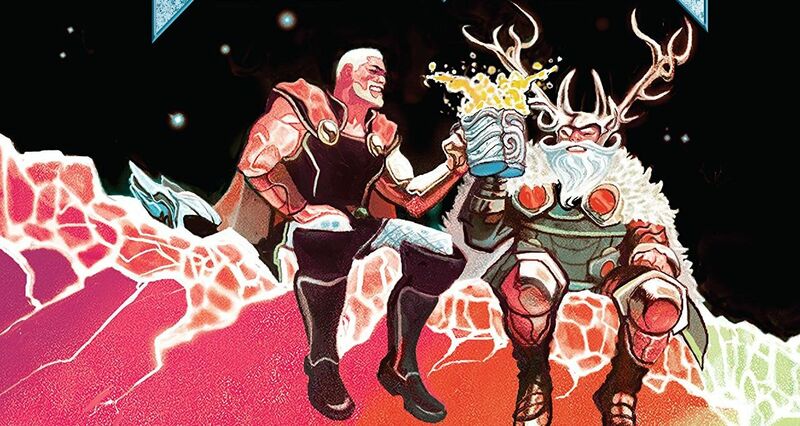 Michael del Mundo’s style is a perfect fit for Asgard and all its fantasy elements. That rainbow bridge looks great! I love the use of the white lines to show the texture at the end of it. The black of the sky background contrasts well against the bright foreground too. The composition here is simple and effective, and it’s a visually pleasing piece all around. I’ve picked Dead Man Logan several times before, and this is probably my favorite one of its covers yet. Declan Shalvey is just such a perfect fit for the character. The image of Logan all wired up in a containment pod is a classic one, and this is an especially striking take on it. The colors are gorgeous and compliment the inks very well. All in all, this is a nice cover. No other currently running comic is as consistently fun as Squirrel Girl. I love the camp value of the game show setup here with the letter board in the background and Spidey and Doreen at the buzzers. Add in the vat of acid and the slanted shadow conveniently covering up the villain’s face and you have a classic good time. Reality of the fantastic: What does it mean to be skeptical in the Marvel Universe? Comics podcast Ep. 7: Wendy’s, X-Men casting, & a Thanos cat defense!